Brand new log sided mountain cabin is private on 7.45 acres wooded land with a large covered rocking chair front porch to watch the sunsets and a large screened covered back porch to watch beautiful sunrises with your morning coffee. Also enjoy afternoon lunches or dinner and watch for deer, hummingbirds, wild turkey or just relax and enjoy the mountain view and if you are feeling energetic a hike down to the creek or just enjoy the outdoors and maybe a night by the firepit and the star gazing is amazing!. 2/2 spacious bedrooms and bathrooms. Master has a king bed with 50" smart tv and with a soaker tub. Guest bedroom has a queen bed and large guest bathroom.You have a fully equipped open floor plan kitchen, dining, living room with gas stone fireplace and 59" smart tv plus laundry room. Beautiful tongue and groove walls and ceilings make you feel that you are really in the mountains.. Not to mention how close the towns of McCayesville GA & Copperhill TN to the grocery store(IGA), shopping, dining, Ocoee River Rafting or Horseshoe Bend Park on the Toccoa River where you can go fishing or tubing only 7 minutes away. 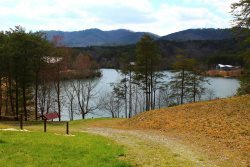 You can spend a day on the Blue Ridge Scenic Railway or just visiting Blue Ridge GA(15 minutes) or Blairsville GA, Hiawassee GA(Beautiful Lake Chatuge for the boater) (25-30 minutes) or lake Ocoee (25-30 minutes). For the gambler they have Harrah's Cherokee Valley River Casino in Murphy NC(30 minutes). If you want to get away from it all this is the place. Just bring clothes and food and enjoy your stay!! - No Pets and No Smoking.